OCD Vampire. Card Artwork. Monster Class: Vampire who really, REALLY, wants to find clean blood victims. This was a tricky one, trying to make a representation of an OCD Vampire. Initial sketches I had of this monster showed it arranging blood samples or bats. 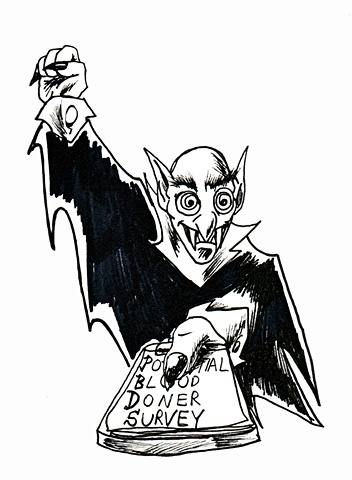 Then, when I just up a drew it in this bat-silhouette of a vampire attacking, but before that, he makes his potential victims take a survey to insure that the blood he's drinking is perfectly clean, healthy, or just the right blood type he's looking for.